The World Magic Cup is the only Magic tournament where players not only don't get to choose their opponents, but they also don't get to choose their teammates. As a result, this event not only often showcases fights between proverbial Davids and Goliaths, but team-ups of them! For the most part, teams are almost guaranteed to field at least one accomplished player. That would be the country's national champion who earned his spot by virtue of having collected the most Pro Points during the 2014–2015 season. He's joined by three teammates who each won a World Magic Cup qualifier shortly following the end of the 2014-15 season. In some cases, this leads to veritable powerhouses with multiple big names on the roster, but in some cases it leads to a group that's three quarters up-and-coming hopefuls who yet have to make a name for themselves. We decided it would be interesting to talk to one representative of each and found prime examples in Team Japan and Team Brazil. We asked the two national champions about their experiences with their teams, who could hardly be any more different from each other. By any metric, one of the most accomplished players in the tournament this weekend was Paulo Vitor Damo da Rosa, currently ranked sixth in the Top 25. With a career that took him to the Top 8 of ten Pro Tours, winning once, and almost twice these numbers at the Grand Prix Level, one could easily argue that the Fall of Famer was in fact the most accomplished player, period. The other members of Team Brazil didn't quite match those stats and, really, how could they? Lucas Esper Berthoud, Leonardo De Castro, and Bruno Müller had a Grand Prix Top 8 and some Pro Tour experience between them, and they earned their invites at the Brazilian World Magic Cup Qualifiers, but clearly Damo da Rosa was heading this team, not just as the nominal captain but as the undisputed leader. Team Brazil, captained by Hall of Famer Paulo Vitor Damo da Rosa. 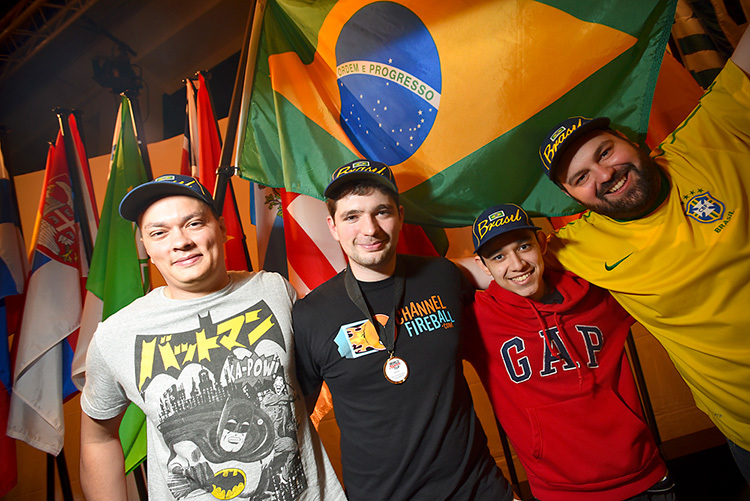 Damo da Rosa had even been captain of Team Brazil once before, in 2012, whereas this was the first trip to the World Magic Cup for his three teammates. It's another point to add to the long list of differences in experience between the captain and his team. "It is different," Damo da Rosa said when asked about the unique challenges of being the leader of such a group. "The testing, for example, is very different from testing with my Pro Tour team. For the Pro Tour, when someone on my team is testing a matchup and gives me a result, I can be sure that that's the actual result I'd get myself. That isn't necessarily true for the World Magic Cup. There's way more coaching involved." He explained that this was quite "normal for this kind of event," and that the World Magic Cup could actually be a great learning experience. While testing Team Sealed pools and decks is important, the World Magic Cup is a team event for a reason. A national champion working with teammates that may not have the same level of experience not only strengthens the teammates, but builds a link of friendship and comradery with everyone on the team. The Danes would surely attest to how great of a learning experience the World Magic Cup could be. While not completely unknown before their victory at the World Magic Cup last year, several members of Team Denmark's past and present teams have accomplished great feats in the last twelve months, including a Pro Tour victory, another Pro Tour Top 8, and various Top 8 appearances at the Grand Prix level. Also, Damo da Rosa had used his international pro player connections and found additional teammates outside Brazil. "We've been working together with the teams of Italy, the United States, and Canada," he said. All of them, unlike the Brazilian team, featured more than one well-established pro, but Damo da Rosa told me, "Those teams all have some players who want to improve as well." They rented a big apartment and had been staying in Barcelona since Sunday. Damo da Rosa explained that it was great to have such a large group of people all testing together and that it helped getting his team into shape too. "It has been going really well." For the Japanese, on the other hand, things had already been going very well during the qualifier season. 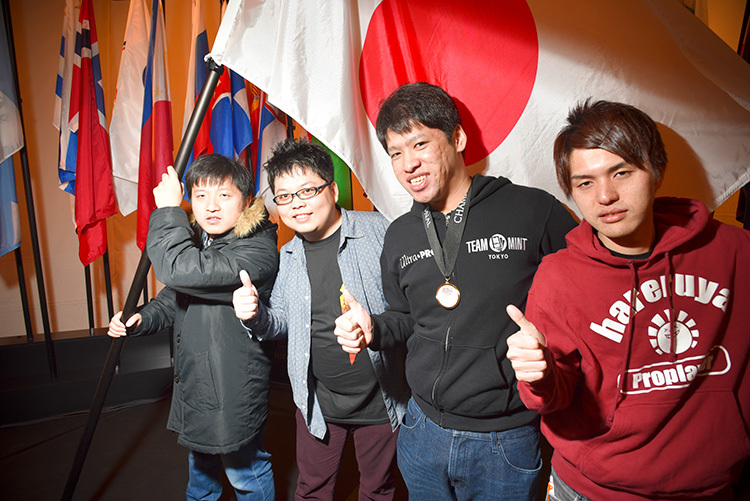 The first World Magic Cup Qualifier was won by Ryoichi Tamada who'd been on a tear lately with two Grand Prix Top 8s last year and a finals finish at Pro Tour Battle for Zendikar. Possibly better yet, at the third WMCQ, none other than Hall of Famer Kenji Tsumura, veteran of six Pro Tour Top 8s, had booked a flight to Barcelona. The only unknown quantity on the team remained Soyo You, although he was described as a true master of the Modern format by Tsumura. Meanwhile, the national champion was no surprise at all. Current No. 16 Yuuya Watanabe had been Japan's Pro Point leader every year since 2012. While the Japanese didn't do well at any of the previous World Magic Cups, one could hardly blame Watanabe. With seven GP wins out of a whopping 23 Top 8s and three Sunday appearances at the Pro Tour as well as a win at the 2012 Magic Players Championship, Watanabe was definitely one of the very best, even by Japanese standards. He also was Player of the Year in 2009. Or as Kenji Tsumura put it: "Yuuya is Yuuya. We are very proud of our captain." Team Japan, captained by No. 16 Yuuya Watanabe. So the contrast between Brazil and Japan couldn't be more pronounced. The equality of the four already showed when I asked Watanabe how he liked being the leader of such a strong group of players. He first consulted with his teammates and they shared a private joke in Japanese. "We just lost round two," Watanabe explained, then added, "But the team is good, yes." The question whether Watanabe did call the shots led to another round of laughter, with the captain making a show of pointing here and there and ordering his teammates around. "He is a mean boss," Ryoichi Tamada joked. "Very strict." About their preparation, Tsumura said, "This time, three people on the team live in Tokyo, and another one came to Tokyo every weekend, so we did testing in real life mostly. Yuuya and I always test together for Pro Tours, so we just had the same approach for this practice." He expressed some regret as to not having worked together with any other teams though. "Collaborating with foreigners is very attractive and very good for us, therefore, we should practice more English and should be more outgoing." Who did they consider to be the best player on their team? After a moment's deliberation, Watanabe pointed at Ryoichi Tamada, and Tsumura and You nodded in agreement. "I'm 1-1 in my matches in the tournament so far," said Watanabe and made a sad face. "Actually, I think we all are." All for one and 1-1 for all, right? In any case, despite the early loss, the Japanese appeared to be a group of friends having fun. Winners already.